Plate 11 from the second set of Thomas and William Daniell's 'Oriental Scenery'. 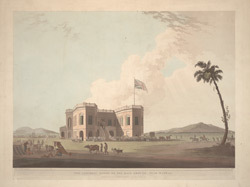 The Race Ground and the Assembly Rooms were situated south-west of Madras near the old British military cantonment. St Thomas Mount, which can be seen in the background, was a favourite place of the British to go to take the air in the evenings. The Mount is traditionally the place of St Thomas martyrdom and is crowned by a Portuguese church built in 1547.